Mesenchymal stem cells (MSCs) are a promising cell source, easy to harvest and differentiate into a variety of mesodermal tissues including fat, bone and cartilage in regenerative medicine. However, for in vivo implantation, a large quantity of stem cells is required with extensive in vitro cell culture to ensure the success of cell-based therapies. As a result, the potential to transfer cell-based strategies from the lab to the clinic is limited. In bone research, immortalized osteoblast cell lines can be used to test novel therapeutic agents and biomaterials as preclinical models of osteogenesis in vitro. In bone tissue engineering, several strategies can be combined to heal and restore large bone defects, including bone graft substitution, stimulation with bone growth factors and suitable progenitor stem cell introduction to induce osteogenesis in vivo. The differentiation potential of pluripotent embryonic stem cells (ESCs) into all tissue types is determined with a gold standard method of teratoma formation; where a teratoma is a benign tumor composed of three germ layers (ectoderm, mesorderm and endoderm) and a disorganized mixture of tissues. It is yet unknown if teratoma-derived fibroblasts (TDFs) can be used as a source of stem cells in cell-mediated regenerative medicine for bone regeneration. The major advantage of TDFs compared with MSCs for bone regeneration is their rapid growth and the easy manipulation of a gene of interest in gene function analysis. Additionally, TDFs can be isolated in large amounts and maintained stably under in vitro culture conditions compared to MSCs, although their in vivo growth for clinical use in comparison with MSCs remains unknown. In a recent study, Yoon Young Go and co-workers isolated fibroblasts from a teratoma generated according to a previously established protocol, via the transplantation of human ESCs in immune-deficient mice. The isolated fibroblasts were able to differentiate into osteoblasts with similar potential to that of MSCs. The authors introduced bone morphogenetic protein 2 (BMP2), an effective growth factor for bone formation, and herpes simplex virus thymidine kinase (HSV-tk) encoding genes into TDFs to engineer a specific, functional TDF cell line (TDF BMP2/HSV-tk) that induced bone regeneration in vivo. By design, after bone growth initiation, upon exposure to ganciclovir treatment (GCV; antiviral medication), the TDF cells underwent elimination by apoptosis due to the presence of the HSV-tk/ganciclovir gene marker. 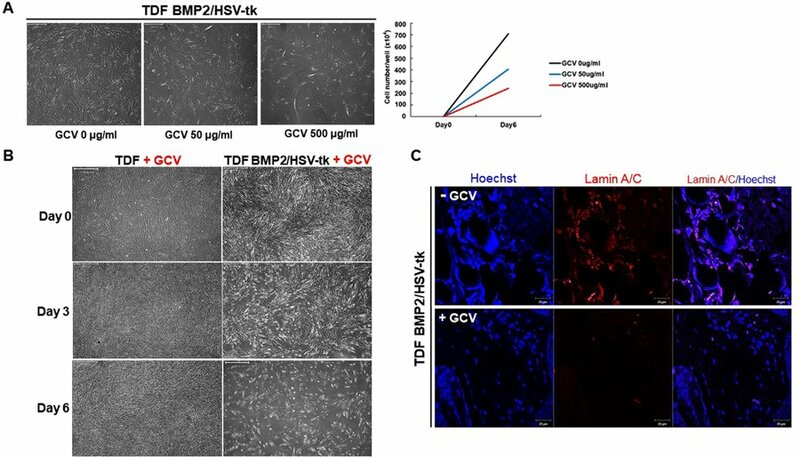 This implied that the HSV-tk suicide gene could modulate side-effects of stem cell therapy, including uncontrollable teratoma and tumor formation. The results are now published in Scientific Reports. Additional concerns of the emergence of cancer cell-like features in the TDF population after in vivo stimulation of bone regeneration were addressed with previous reports showing that the re-injection of TDFs did not re-establish teratomas in mice with severe combined immunodeficiency (SCID). 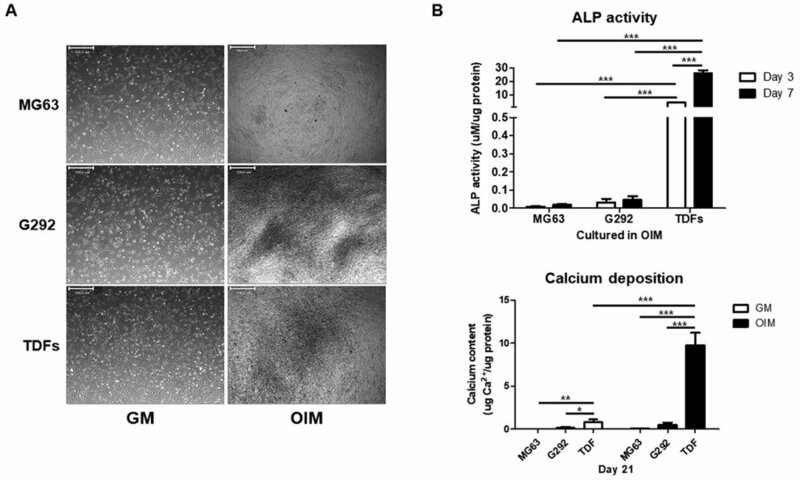 In the study, the engineered cell line showed enhanced alkaline phosphatase activity (ALP), elevated calcium content and mRNA expression of osteogenic genes in vitro, followed by remarkably improved bone volume formation in animal models in vivo. The research revealed a safe and highly efficient technique for therapeutic application of bone regeneration. 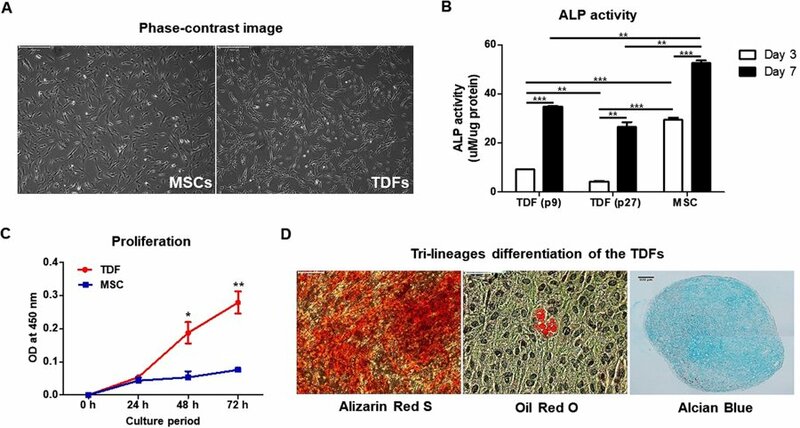 The authors initially observed the morphology of TDFs and MSCs, followed by ALP activity, rates of proliferation and rates of differentiation. The MSCs indicated greater capacity to differentiate into osteoblasts compared with TDFs, while proliferative assays showed a significant increase in the rate of TDF growth. Trilineage differentiation typically observed with MSCs was similarly confirmed with TDFs using histological staining to distinguish osteogenesis, adipogenesis and chondrogenesis. In addition, when compared with diverse human osteoblast-like cells, TDFs demonstrated greater capacity for osteogenic differentiation. The authors further investigated the functional cell line with bright field imaging, ALP activity and calcium deposition assays in growth media (GM) and osteogenic induction media (OIM). The cell line was able to self-produce the bone growth factor (BMP2) for increased intracellular calcium content and greater osteogenic differentiation capacity. This was determined via the expression of osteogenic marker genes including ALPL (bone development and regeneration), IBSP (structural protein in the bone matrix), Runx2 (bone developmental regulator) and Osterix (SP7, bone specific transcription factor). On exposure to GCV treatment, the engineered cell line underwent apoptosis, whereas the TDF control survived. 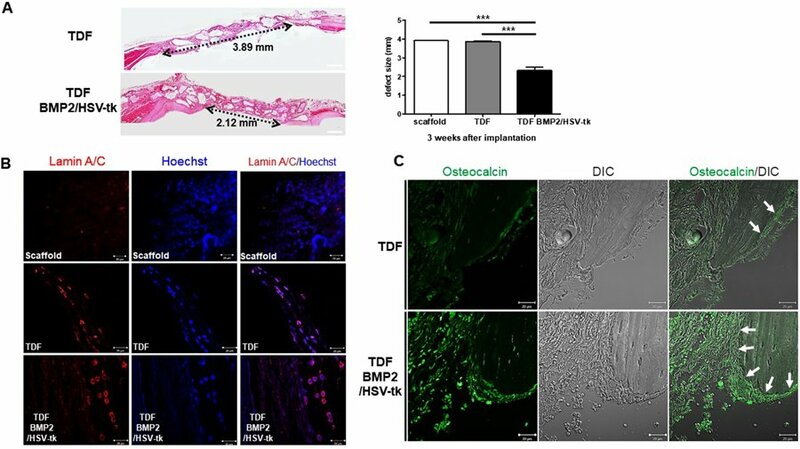 To determine the bone-forming capacity of self-produced BMP2, the engineered cell lines were incubated with a biphasic calcium phosphate (BCP) or polycaprolactone (PCL) scaffold in osteogenic induction media and implanted into a bone defect region (cranial or tibial) in an animal model. In a cranial defect model of cell line implantation, the collective results of histology and 3-D micro computed tomography showed new bone tissue formation by three to four weeks. Post-implantation, the optimum GCV concentration was determined at 500 µg/mL and visualized with or without treatment using Laminin/Hoechst staining. The in vivo bone forming capacity of TDF BMP2/HSV-tk cells in a mouse cranial defect model. A) H&E staining of cranial bone defects transplanted with the control TDFs vs engineered TDF BMP2/HSV-tk after 3 weeks of implantation. B) Laminin staining of the scaffold, control TDFs, and TDF BM2/HSV-tk. C) The bright-field differential interference contrast (DIC) images and osteocalcin staining uptake (green) observed with confocal laser scanning microscopy. Credit: Scientific Reports, doi: 10.1038/ s41598-018-32946-6. The study cleverly exploited the gold standard of pluripotent stem cell analysis to generate teratoma-derived fibroblasts (TDFs) that differentiated into bone tissue. Such TDFs can be engineered from the patient’s own cells to form patient-specific osteoblasts for transplantation. The authors ultimately intend to generate safe and functional cell lines for therapy in bone research. Immortalized osteoblast cell lines can be used to test new drugs in preclinical models for orthopedic applications. The authors incorporated HSV-tk as a suicide gene to eliminate unexpected cancerous proliferation of the engineered cell line, which, when triggered by GCV treatment, led to programmed cell death. The cell line has great potential as an unlimited cell source that genetically matches the patient to differentiate and regenerate bone for immunologically safe clinical translation.